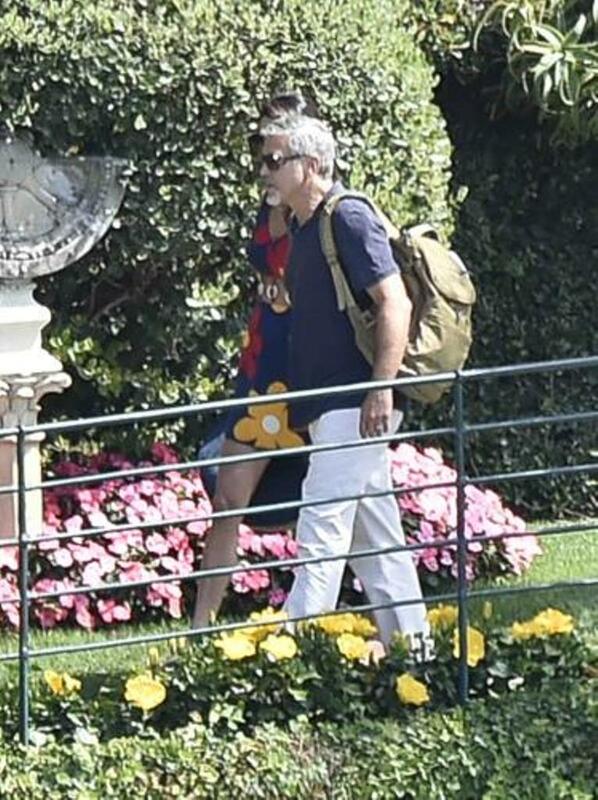 Amal and George Clooney spotted before they leave their hotel in Portofino on board of a Fiat 500 Abarth. I am not sure if it is true, pregrant I will never drink wine …. Amal Clooney wore a short floral blue dress with black sunglasses. Perfect dress for the Dolce Vita. They look relaxed and happy. I absolutely love the dress , and her body changed in recent pictures . Lovely Amal you’re lovely . I love this dress. So retro. The National Enquirer is known for fabricating its stories. They just make them up to sell their paper. They have been reporting her “pregnancy” the last 2 years. I would not repeat anything that they say on this blog because it cannot be verified. I don’t think that she’s pregnant. She’s drinking wine in several of the recent photos, and that’s extremely risky in early pregnancy. They are confident she’s pregnant only because George’s rep didn’t deny it yet . (Sarcasm) I’m sure that George Clooney’s rep lives to respond to every single tabloid headline. Jackson is correct. The National Enquirer is known for false reporting. Just like OK. They are tabloid magazines that are constantly being sued and taken to court for lies, false reporting, making up silly & goofy stories, and never reputable or respected. Not sometimes, but all of the time. Don’t believe anything they print; 100% of the time. And next week they will be headed for divorce it’s always the same ridiculous stories from the national liar. She has been drinking wine there is no way she would do that if pregnant. What happened with Amal´s career? Does anyone know? Drinking a glass of wine when pregnant is not uncommon. A lot of research shows that it will not harm the foetus. 1) Absolutely not true. 2) Just because plenty of people do it does not mean it is okay to do so. I have to side with Liz… alcohol is a strong substance.. it could totally make a strong effect on the fetus… i would not take any risk if i was pregnant. Why is it that when two people get hitched it’s assumed a baby will follow. I really don’t think they will have kids. hey.. not every woman must have a child! It is OK to opt out. I like the style of dress, but never a fan of the 60’s flower power patterns. The dress is cute and looks very appropriate for the circumstances, but looks like it would be a lot more comfortable without the belt (? ), if I am seeing that correctly. At least it looks like a belt. Nati: I think all of us would be appreciative if you were to remove your statement from a tabloid that makes things up that Amal is pregnant. Your blog is a higher quality than this type of gossip. I am also concerned about the addition of two photos that appear to indicate that George Clooney does not appreciate being photograhed outside his hotel room. What is the purpose of this kind of photograph other than to illustrate the harassment by a photographer of a person on a vacation with his wife? What happens if George does not appreciate being photographed, but Amal loves being photographed? Michelle- What exactly are you referring to in your comment? Nati removed the two photos where George was outside his hotel room looking very annoyed that someone was photographing him. That really is an invasion of privacy to follow someone to the room they are staying in and photograph them. That is not the price of celebrity. It is a clear invasion of privacy. Jackson- If Amal loves to be photographed is that an invasion of privacy as well? Michelle- None of us know if either George or Amal love being photographed. Respecting privacy is what I am talking about. Jackson- The question is not whether we know if Amal loves to be photographed. The question is if Amal loves to be photographed, is that an invasion of privacy? When you say “none of us,” that is very assumptive for the millions who have visited this website. I love the bold print on the dress and how it’s belted. Not crazy about that short length. Seems like it would be difficult to sit in.